Just so there is no more confusion, this doggie bowl lets everyone know who's eating from this dish. It also tells everyone who sees it how much affection you have for your pampered pooch. 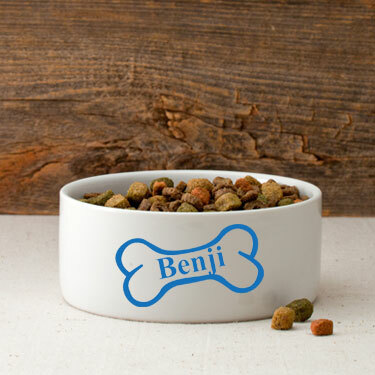 Dish is personalized with your pet's name; specify up to 10 characters. Dishwasher safe. Sturdy ceramic bowl weighs 3 lbs. 3" high, 6 7/8" high. Specify Black, Blue, Clay, Golden Yellow, Gray, Green, Pink, Purple or Red. Allow 2-3 weeks for delivery. No rush delivery or gift box. Item can only be shipped within the Continental US.